Trilogy Excursions: Maui's Oldest Sailing company and largest fleet of sailing vessels. Pipeline: Contour 50' Trimaran, sailed from Ft. Lauderdale to Tahiti to Maui in 2011, their crew is getting ready to sail back down to Tahiti in summer of 2014. Scotch Mist: The Scotch Mist II is a Santa Cruz 50 sailing yacht built in 1982 for racing. They offer sailing charters from Lahaina Harbor, Slip #2. Morning Star: A 45' keel ketch built in 1948. Leighton Richardson and his wife Linda are members of the Seven Seas Cruising Association. While cruising they are currently writing articles on the facilities available to cruisers in the Hawaiian Islands. Paragon: Paragon Sailing Charters is a premier catamaran company on the island of Maui. They have two high performance sailing catamarans, PARAGON and PARAGON II. Hula Girl: 65x35 ft, state-of -the-art, multi-million dollar, custom charter catamaran is a smooth, fast, sleek, sailing yacht, capable of true sailing in the light winds off Lahaina or steady trade winds of Kapalua. With a 97 ft. rotating wing mast, electric winches, spectra laminate high tech sails, and even a light air reacher on a bow sprit. 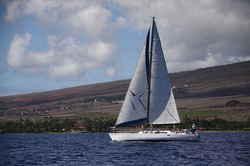 Gemini : A 64' catamaran based out of Ka'anapali beach. Pride of Maui: 65' Power Catamaran based in Ma'alea for Molokini snorkel tours and whale watching.